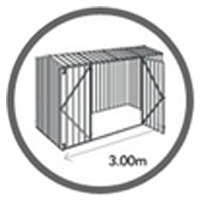 A secure, safe and weatherproof space to store valuable vehicles, machinery and more. Our 3.60m (span) x 6.00m (length) x 2.40m (height) Single Door Garage is the perfect storage solution to protect your car, motorcycle, jet ski or boat. A primary focus of our design and materials is quality. We use only the highest quality 0.47 hi-tensile steel and premium top hats and purlins, so all of our sheds are safe, robust and will withstand anything you throw at it. Our Single lock-up garages are designed with your needs in mind. Choose from our colour options of Slate Grey, Mist Green, or Smooth Cream finish. • BUILT TO CODE: Each and every shed design is engineered to meet all Australian building codes and come with site specific engineering. Our sheds are strong, durable and safe, giving you peace of mind for years to come. • ENTIRELY CUSTOM: Everybody has their own individual requirements for sizing, shape, colour and layout. A custom design ensures your requirements are met and your workshop or shed is perfectly suited to your needs. • CERTIFIED INSTALLERS: Our network of Custom Shed installers across southeast Australia means we can have your new shed correctly assembled against our engineering plans. An effortless and simple assembly. Get in touch to discuss your requirements! All Custom Commercial, Rural & Industrial products can be delivered directly to your desired location for Free. Using a specialised vehicle, there is no need to worry about providing a hand when our team is on site. We will take care of the entire delivery, making the whole process as Easy as possible for you. 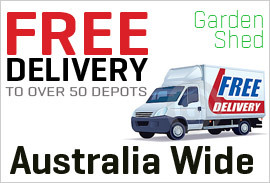 We deliver within 400km of Albury/Wodonga at no cost. EasyShed Rural & Industrial sheds are manufactured to order. Your order should be ready for collection or delivery within 7 days of order confirmation and payment. Delivery is managed by our in-house logistics team and will occur immediately upon the completion of its manufacture. We will book a delivery date and time that suits you best. Due to the size and weight of this product, an assisted-list device will be used for delivery. If property access is restricted, delivery may need to be to curb. GardenShed will do everything possible to ensure the delivery is as convenient as possible for you.